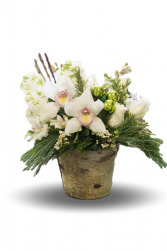 Babies Breath gives just the right amount of white to make it look like it is snowing in this Country Christmas arrangement. 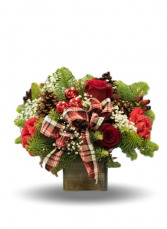 It is also accented with fragrant evergreens, roses and carnations. Box is 4" tall. 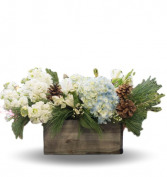 Upgraded prices include more flowers and are designed to keep the same look and feel of the arrangement. "Good Tidings" we bring to you or your kin this holiday season as we wish you a Merry Christmas. 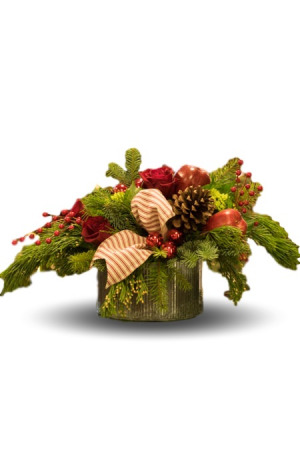 Upgraded prices include more flowers and are designed to keep the same look and feel of the arrangement.